← Home Sweet Home, At Last! I took that title directly from an event that some of my swimmer friends made to kind of celebrate me. I was (and still am) so feeling loved, and that my friends really care about me and would take the time out of their days to plan an event. By the way, it was incredibly fun. Mark, my brother, was originally supposed to come with Dee and I, but he decided at the last minute that “he does not like hot dogs”, “those aren’t my kind of things” and that I was taking advantage of him by making him drive me there. Um, no, I just wanted to bring my brother along with me to have fun (and DeAngela is more than capable of driving) and make him get out of the house a little bit and spend time with people he also knows. That, and I am well aware that I have a timeline and I would like to spend as much time with friends and family as I can, and he is no exception. Somehow I do not think this is a subject that he grasps. I love him and at least want to share some moments with him before I pass (which is hopefully in quite a while). Anyways, Dee and I drove up to Concord, which is about 1 1/2 hours away from where I live in Elk Grove. We were fashionably late to the event, but that was ok because not everyone was there already anyways. In total, the people who were there were the following: Courtney, Colette, Peachy, Guy, Emily, Steven, Tyler (aka Smurf), Eduardo, Charlie (aka Cheese, but only for an hour), and Mariah (who had literally just got back from Mexico). We all stayed in the house for a while, sipping on some water, soda, and some margarita mix with water (made by Guy and Emily’s mother) and I have to say, it was quite refreshing. Tyler was chilling in his speedo the entire time with his cheeks popping out, which is not unusual for swimmers so it did not take anyone off of their guard. We munched on some chips and cheeze nips (I am not sure how exactly to spell those to be honest, and I am too lazy to look them up this late) and then eventually got to our weenies. Now, these were no ordinary hot dogs. These were probably about a foot long each, and we had the choice to eat Polish dogs or all beef hot dogs. Knowing that my throat and esophagus are not extremely happy with me due to radiation, I went with the all beef hot dog with ketchup and mustard. Oh, and our buns were much too small for the hot dogs, so we had quite a few dirty jokes about that flying around. After everyone had eaten their hot dogs and had their tummies all content and bloated, we decided to go for a swim. Dee and I had not brought swimsuits, so we had to borrow from Emily’s collection and we each found pieces that worked for us both. Oh, and I should mention, that Guy and Emily’s house is HUGE! I have no clue how many rooms there are, but there are nine people living comfortably in the house (including four foreign exchanged students). I think the house was at least three stories high, but I am not sure. They have a nice sized pool in their backyard, which seemed to be more of a vineyard. When it came to jumping in the pool, Courtney told us that you could jump off of a balcony to land in the pool. Being the adrenaline junkie that I am, I followed her, Tyler, and Colette to Guy’s room where the balcony was. It was a little scary at first, as jumping from a decently high spot normally is, so we all fought over who was going to jump first. Tyler said he was going to jump first for me, but then Colette did not hear this and decided that she was going to jump in first. Then Tyler, then I jumped, then Courtney. It was a whole lot of fun, if I do say so myself (DeAngela later confided in me that she was scared when I jumped off of the balcony as I had just gotten out of the hospital). The pool was nice and warm so it was comfortable. I certainly got a nice workout from all of the water that I was treading to stay afloat. We took quite a few underwater pictures with one of those new phones that is waterproof, but since it was dark by the time we took the pictures, the flash ruined the pictures and most did not turn out the way that underwater pictures are meant to look like. After we were getting a little cold, everyone got out of the water and made a beeline towards a firepit- which happened to have a fire roaring. That felt so nice against my moist, wet skin and it was able to dry me off pretty darn fast. 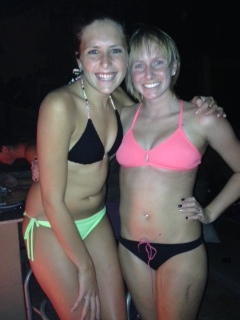 We sat around the fire pit in our swimsuits taking pictures to make some memories last a bit longer. S’mores were made and eaten, and I did not partake in this because of the feeling of always having a heartburn that increases whenever I eat, so I was not going to aggravate my throat and esophagus any more than it already was. We talked and shared stories, and everyone wanted to know how I met my fiance, to which I told them that we had met through high school wrestling, when he transferred to my school and joined the team I was on. After a while, Tyler and Steven left because they knew they had work in the morning and did not want to feel miserable. We all stayed for about another hour or so before Colette decided to leave, which prompted me to leave as well, because it was already pretty late and I did not want DeAngela to be too tired to drive back (although Emily did offer to let us sleep there, I really wanted to sleep in my own bed). As we were all saying goodbye, Eduardo and Emily handed me a bag that had a Starbucks bottle in it as well as some instant lime refreshers, because it has been so hot, according to Eduardo. Mariah also handed me an envelope. I opened it once I got home and it was a very sweet, handwritten letter and a really cute necklace that she had gotten in Mexico. Dee and I had to use directions to get home, so we used our trusty iPhones to get us home. Um, it took us the back, back way to get home and it was a little scary. We had to go through the Sacramento River roads and such, which are narrow, and were hardly on any freeways the whole time. Luckily, we got home safe and sound. I am pretty darn tired, and so is my kitty, so I am going to go to bed now. Oh, and if you did not notice, you can get to my blog by going to thenotdyinggirl.com which in my opinion is so much easier, so spread it around if you can! I want to reach out to as many people as possible! You daredevil, you! Jumping from the balcony….ummmm no thank you. You are so loved, Lauren.